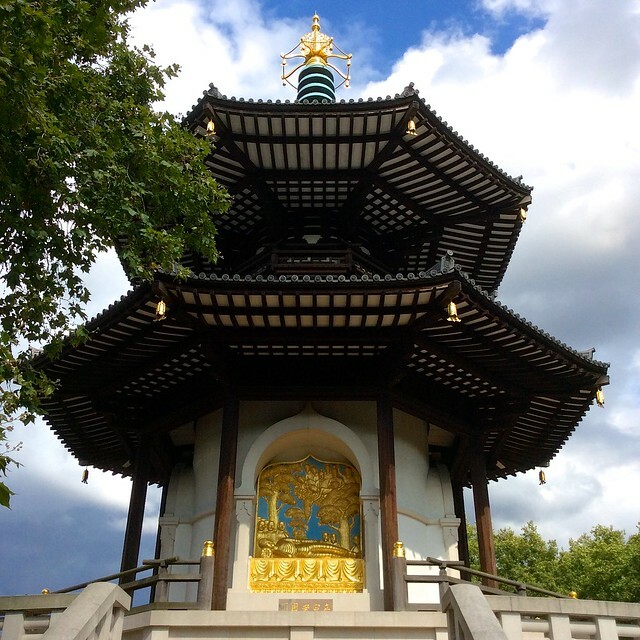 This week I ventured south of the river (but only just) to visit the peace pagoda in Battersea Park. 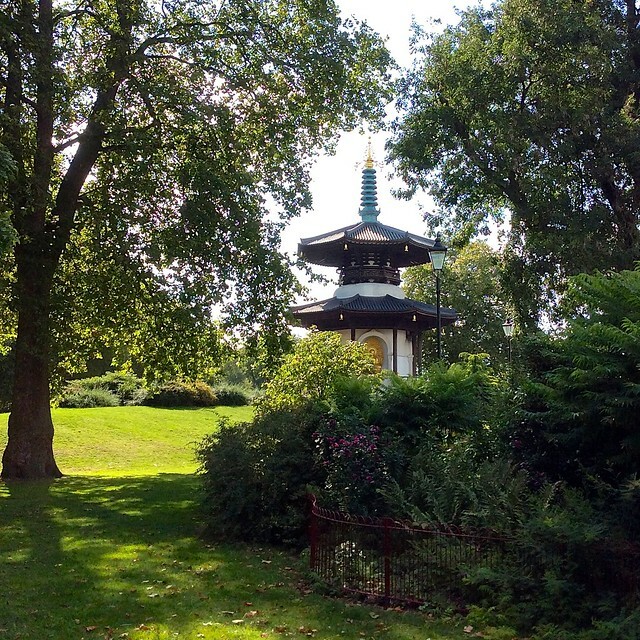 If you’re a local you’ve probably jogged past it many times as it’s on the bank of the River Thames, and you may even know its story, but if not, I imagine you’re now asking, what’s a peace pagoda, and why is there one in Battersea Park? A peace pagoda is a Buddhist stupa (stupa means heap), a monument to inspire peace and to help people of all races and creeds in their search for world peace. Most (though not all) peace pagodas constructed since the second world war have been built by the Nipponzan Myohoji, a religious movement that emerged from the Nichiren sect of Japanese Buddhism, founded by Nichidatsu Fujii. Fujii met Mahatma Gandhi in 1931 and decided to devote his life to promoting non-violence. In 1947 he began constructing peace pagodas as the spiritual focus to unify the movement for world peace. There are peace pagodas all over the world, in Europe, Asia and the United States. 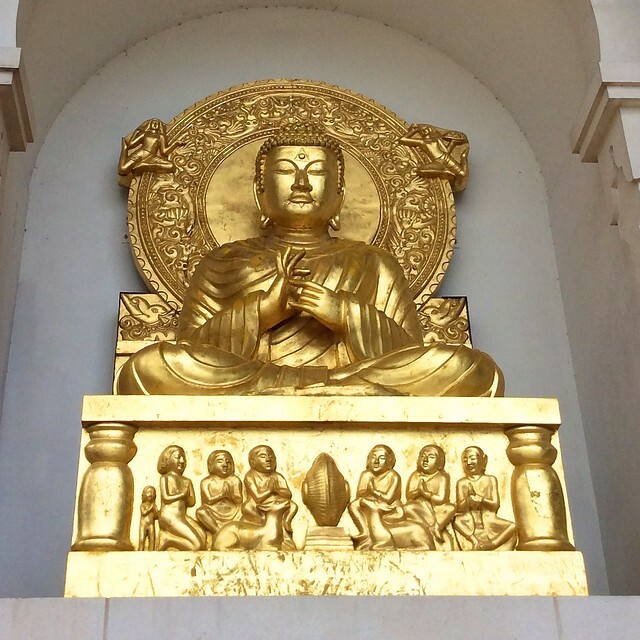 The London peace pagoda was the second one built in the UK; the first is in Milton Keynes. 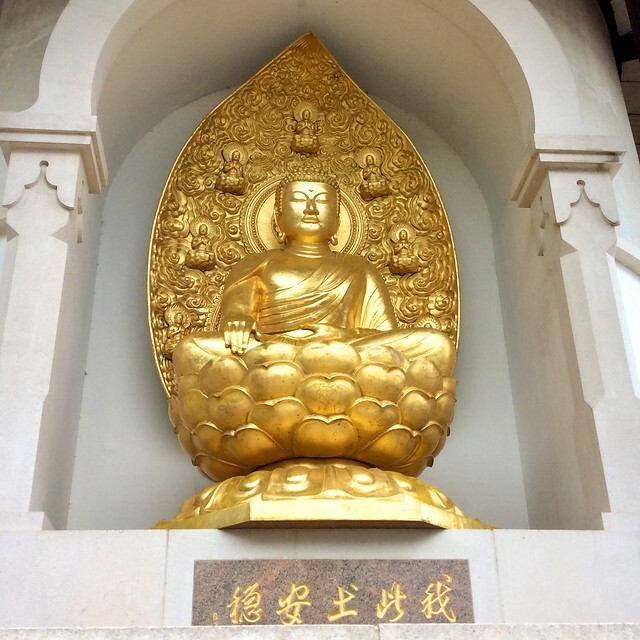 The pagoda is 33.5 metres tall and features a gilt-bronze statue on each of its four sides. The statues show some of the Buddha’s mudras (hand gestures). The gestures performed by the hands of a Buddha image have specific meanings that refer to some event in the life of the Buddha and denote a special characteristic. This position of the arms of this statue is associated with the Buddha’s birth, but birth statues normally have a finger on the raised hand pouting upwards and one on the lowered hand pouting down to represent Buddha’s mission on earth, the unification of heaven and earth. The pagoda statue has the lower (left) hand in the Varada Mudra, the hand lowered with the palm facing outward in the gesture of bestowing blessings or giving charity. This hands of this statue are in the Bhumisparsa Mudra in which the left hand lies in the lap, palm upward and the right hand bends over the right knee, with fingers slightly touching the ground. This gesture symbolises enlightenment and steadfastness. In this statue the Vitarka Mudra, associated with explaining the Buddha’s teachings, with the right hand right raised and the tips of the forefinger and thumb touching, is combined with the Tarjani Mudra for warding off evil, with forefinger and little finger outstretched. In this statue the Buddha has attained Nirvana in death. 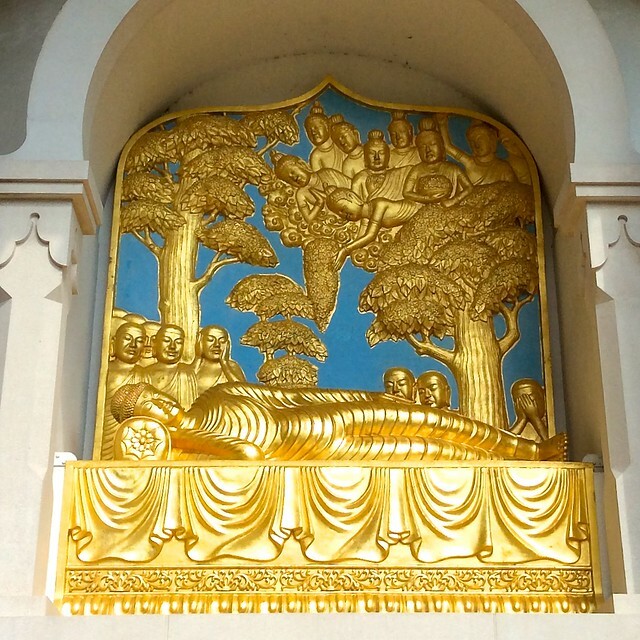 The right arm is lying next to the body – if it was supporting the head of the Buddha, the image would show the Buddha resting. 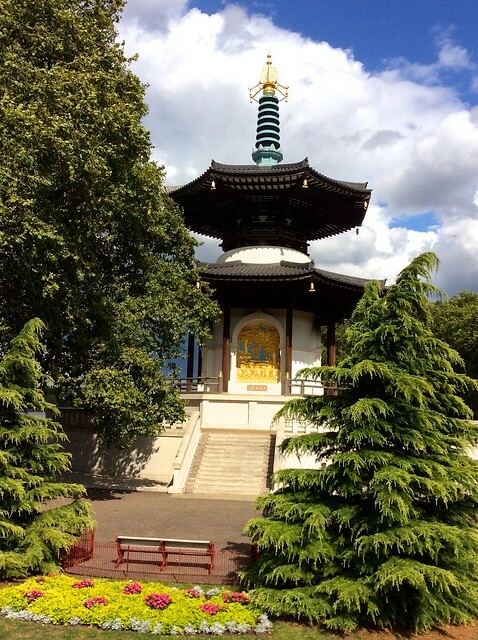 The Pagoda is on the riverside in Battersea Park, roughly half way between Albert Bridge and Chelsea Bridge. 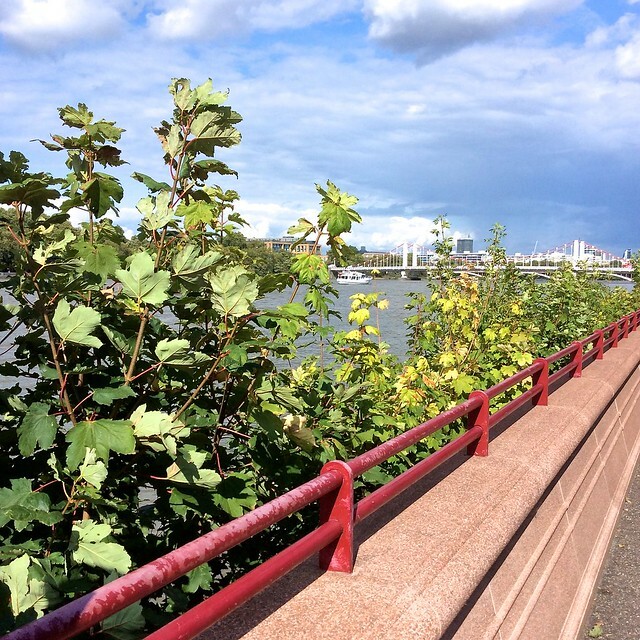 Battersea Park is open from 8 am until dusk. 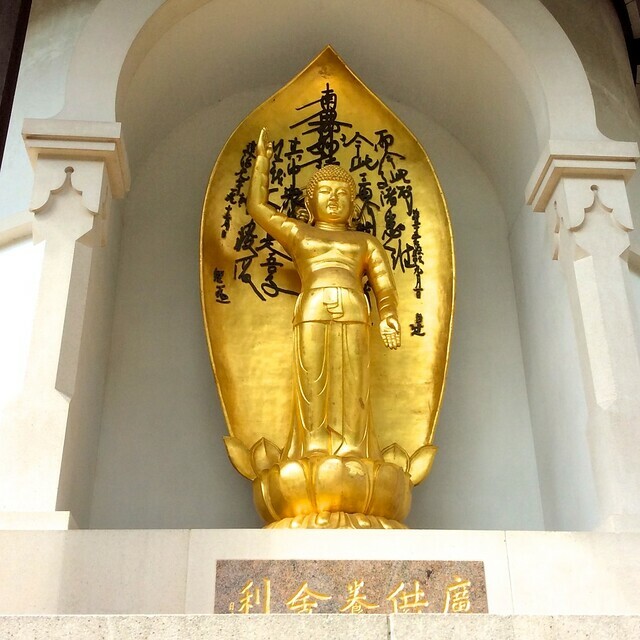 This entry was posted in Japanese Gardens and tagged arts, Battersea Park, Buddhist mudras, London, Nichidatsu Fujii, Nipponzan Myohoji, Peace Pagoda, world peace by Fran. Bookmark the permalink. I appreciated the detail of the meaning of the hand positions. Thank you. Thanks – it took a bit of research but it was worth it. I always learn something from you – I hadn’t realised it was such a relatively recent building. It also reminded me of visiting the Stupa in Pokhara in Nepal. My local host kept telling me I should go, and it took me an embarrassingly long time to realise that he was saying ‘Peace Stupa’ and not ‘Pea Stupa’.